Good afternoon Christian writers, here we are again, another week has flown by, and here is another writing tip. Or perhaps it’s more of an encouragement . . . I’ll let you decide! Anyway, I hope you will find these three quotes helpful. Karen is a bestselling author of Christian fiction (historical romance) – not everyone’s cup of tea, but you might like to look her up! 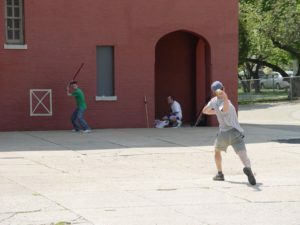 And if you have no idea what a stickball team is, it’s a game kids play with a stick and ball in the street in the USA . . .
Reading expands our horizons in a way nothing else can – no doubt about it. Coming back closer to home (assuming you’re reading this in the UK), Roald Dahl said, “If you are going to get anywhere in life, you have to read a lot of books.” According to Wikipedia, his books have sold more than 250 million copies worldwide, so if you are an aspiring writer, his advice has to be worth taking! So, what’s on your reading list this year? Why not delve into something completely different? It will help you be a better writer, for sure. P.S. If you have a good writing quote that might inspire others, please email it to me and I’ll pass it on – or you can add it below – let’s encourage each other!